Forty representatives from community support organisations across the Nanango Electorate, including local group, Fresh Hope* had the opportunity to meet the State Government’s Minister for Communities, Child Safety and Disability Services, Tracy Davis at a dinner in Kingaroy on Monday night, 17th February. Member for Nanango, Deb Frecklington welcomed representatives from Fresh Hope to the meeting with the Minister for Communities, Child Safety and Disability Services, Tracy Davis. 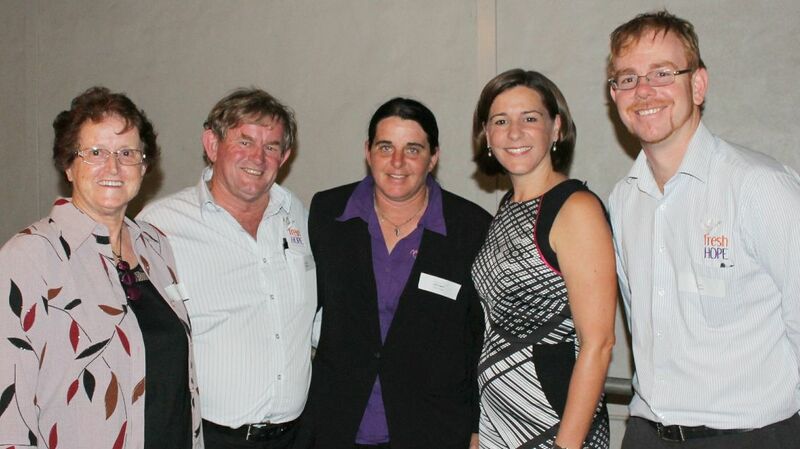 From l to r Mary Jibson, John Bartlett, Lee Collins, Deb Frecklington and Will Curtis. Member for Nanango, Deb Frecklington, invited the Minister to visit the region to provide community service groups with the chance to talk one-one-one with the Minister about local issues. “I wanted to ensure our community service groups had the chance to meet the Minister who represents their sector and speak with her about issues which are affecting our region,” Mrs Frecklington said. “I must thank Mary Jibson, John Bartlett, Lee Collins and Will Curtis from Fresh Hope for making the trip to Kingaroy from Crow’s Nest. They had the opportunity to speak with the Minister and her Policy Advisor to share their story about the amazing work being done by the Fresh Hope organisation,” she said. “The night was also great opportunity to hear first-hand from the Minister Davis in regards to the roll-out of the NDIS (National Disability Insurance Scheme), the recommendations of the Carmody Report, the Queensland Disability Plan and the (NDIS),” she said. *Note: Fresh Hope is a not-for-profit community association which offers a caring family environment for mothers and their children seeking help for the mother’s substance abuse while remaining together as a family. They are the only facility in Queensland providing this unique residential service.